What is Kirkland Signature Extra Strength Glucosamine and Chondroitin? Kirkland Signature Glucosamine and Chondroitin is a joint supplement from Kirkland Signature, Costco’s private label for their products. Besides supplements, they manufacture a variety of other household items. 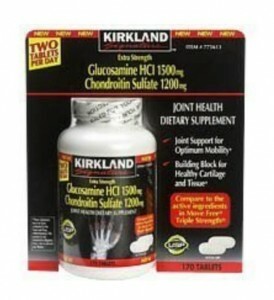 Kirkland Signature Extra Strength Glucosamine and Chondroitin has the ubiquitous glucosamine+chondroitin combination. We especially liked its USP certification. The United States Pharmacopeia sets standards by which prescription drugs are made. We found no artificial dyes or coloring in Kirkland Signature Extra Strength Glucosamine and Chondroitin. Glucosamine Uses 1500mg of USP glucosamine hydrochloride. Glucosamine is a precursor to glycosaminoglycans which are a major component of joint cartilage. I would like to know where this product is formulated and put into it’s tablet form. Is it a product made in America? I’d like the answer to the maximum dosage, too. I’ve just started taking the supplement and already notice benefits in my hands after one day. I was taking gluosomine ,and than I stopped. While on vacation I have tried to do more walking and I get these terrible pains on the side of my legs. I did have a cartlidge injury a long time again, is it because I stopped the glusomine?